The DUO DERISSEN & VAN GARSSE has started in the end of 2012.They bring a mix of jazz standards and own compositions. The combination of only violin and double bass is original in jazz, and offers very interesting possibilities. They take you into the exploration of a universe with rich harmonies, melodies and rythms. They perform regularly in jazz clubs, small cultural centers, or for private parties such as weddings or for home concerts. 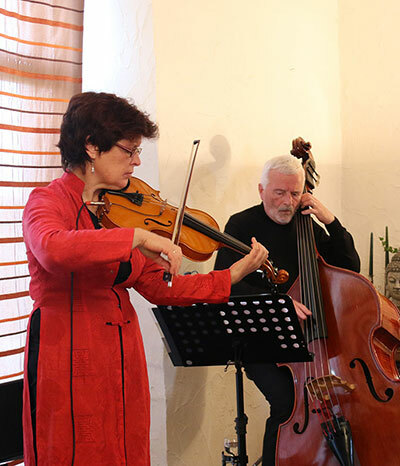 Françoise got her degree in classical and in jazz violin at the National school of music (Conservatoire Royal) in Brussels, She completed her formation with several intensive courses with first-class jazz violinists Jean-Pierre Catoul and Didier Lockwood. When he was 14 years old, Marc Van Garsse plaid piano with the drummer Marc Serwir in the young jazz band of Sint Niklaas « The Manathan boys ». They won a competition and plaid in a beautiful festival. In 1966, Marc has bought a double bass. The double bass quickly became his instrument of choice. In 1977, Marc became the bass player of the jazz band “ Jazzcircle”. They plaid in several beautiful festivals as “the Middelheim”, the “Gouvy jazz”, the “Laren”festival etc… Musicians Marc has performed with include Art Farmer, Dave Pike, Charles McPherson, Charles Loos and Toots Thielemans. After several years as interior designer, Marc has now a lot time for music. He plays in duo with the singer Lieve Beurghs, in duo with the violonist Françoise Derissen and in other projects.